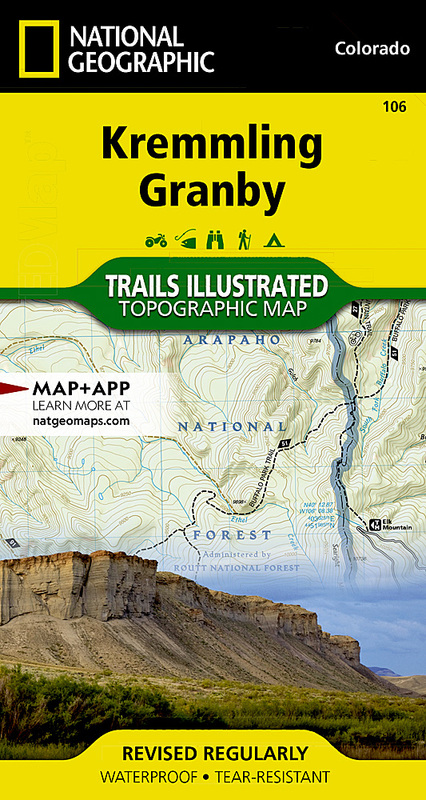 National Geographic's Trails Illustrated map of Kremmling and Granby delivers unmatched detail and valuable information to assist you in your exploration of this popular recreational area. Expertly researched and created in partnership with local land management agencies, this map features key points of interest including Arapaho National Recreation Area; Wolford Mountain, Hinman, Willow Creek, and Williams Fork reservoirs; Cottonwood and Gunsight passes; Hot Sulphur Springs, Junction Butte, and Kemp-Breeze state wildlife areas; portions of the Colorado and Blue rivers; and the towns of Kremmling, Granby, Parshall, and Hot Sulphur Springs. Additional information on the Wolford Mountain Area which has an extensive system of routes for travel by foot, horse, mountain bike, motorcycle, ATV, and 4x4 is also included.